FRESNO, CA. — Former MLB All-Star and current MLB broadcast analyst, Harold Reynolds, has been named the keynote speaker at the 54th annual Hot Stove Gala, to be hosted by the Fresno Grizzlies. The event takes place on on Feb. 7, 2015 at the Fresno Convention Center, located at 848 M Street in Fresno. The event will also include award presentations to local high school athletes, coaches and teams, as well as a presentation to the Al Radka Award recipient for community service. Source: The Fresno Bee. 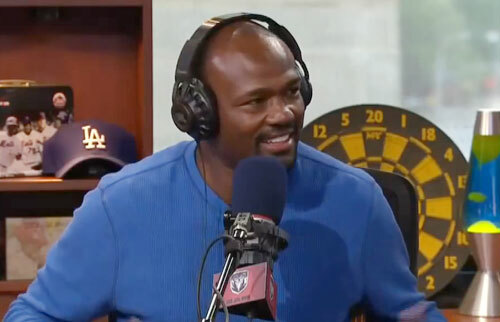 Photo shows Harold Reynolds speaking on The Dan Patrick Show in September 2014. Hot Stove tickets are $75 per person ($30 for youths 12 and younger) and include a three-course dinner with wine, raffle prizes, a chance to bid for baseball memorabilia items at a silent auction and the opportunity for photographs and autographs with the special guests. Contact Grizzlies’ Whitney Campbell at (559) 320-2547 or wcampbell@fresnogrizzlies.com for tickets. All proceeds benefit the 501(c)(3) Grizzlies Community Fund. Watch harold Reynolds speaking with Dan Patrick in Sept. 2014. Reynolds played primarily for the Seattle Mariners (1983-92), but also played for the Baltimore Orioles (1993) and California Angels (1994). He has been an analyst on MLB Network since its launch on January 1, 2009. He was nominated for a Sports Emmy Award for his work as a studio analyst on MLB Network in 2010 and 2011. He recently completed his first year on FOX’s top MLB broadcast teama alongside Tom Verducci and Joe Buck. The crew called the 2014 World Series and All-Star Game. He also has spent six years as a lead analyst for the MLB Network and in 2013 won a sports Emmy for outstanding studio analyst. Sports Speakers 360 is a booking agent for pro athletes. If you would like to book Harold Reynolds for a speaking engagement, appearance or endorsement, contact Harold Reynolds booking agent for fees at 1.855.303.5450.